2016 was a good year for me photo wise. I was able to go to several locations that I had never been to before. Additionally, I won the Photographer of the Year for my local camera club. For several years I had been trying to achieve that honor only to fall short so it was a great feeling to accomplish a long sought after goal. My first major trip of the year was at Big Bend in April with some friends and fellow photographers. It was my second time to the park but the first time with a knowledgeable guide who goes to the park several times a year. We had timed the trip to coincide with the new moon. This gave us some flexibility. In case the conditions during the day were not great for photos then we could do some during the night. 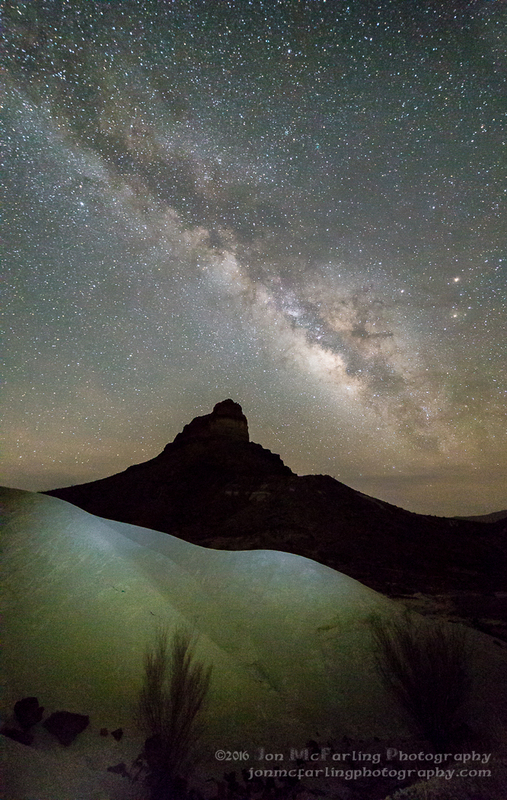 Big Bend has some of the darkest skies in Texas. So for the nights we explored several locations taking pictures of the Milky Way. It was these nights that I was able to try my first new technique for the year. I had seen several pictures of the whole arc of the Milky Way. So each night I shot a series of shots to stitch together later. While working on these stitched panoramas I found that Photoshop wasn’t quite doing it correctly and decided to try the Hughin software with good success. Probably the best example is the one here. 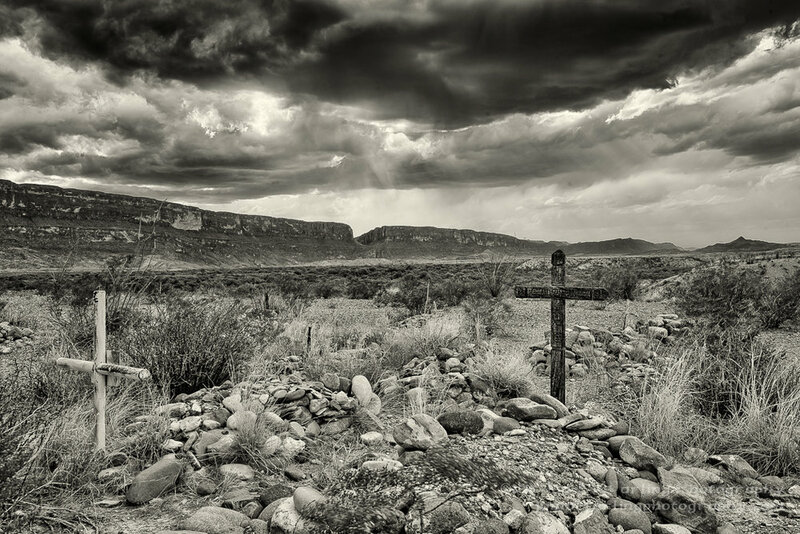 This was at the Dorgan Ruins near Santa Elena Canyon. I took a series of five shots moving right to left. Besides taking panoramas I also took regular shots of the Milky Way around the Castolon area of the park. My favorite of these is this one. Here I set my tripod as low as I could in the middle of the road, on a whim I switched my headlamp to the red light to light the road. The resulting shot was a keeper. We spent a total of a week in the park with my ride and I ending the trip at Rio Grande Village and a soak in the hot springs. Here are some others from this trip. In June we had some significant rain and the Trinity River flooded. In 2015 when the Trinity flooded I was able to get a nice shot of the Dallas skyline and decided to try again. It was a cloudy damp morning and the tops of the building were just about at the cloud line. I took several different shots and the clouds caused some interesting lighting with the building lights. The color version was nice but I converted to black and white and it came out just moody enough. I usually take a vacation in mid-September as my summer activities are over and fall color in the mountain west it starting or peaking. This year I went to Utah for a few days then up to home in Idaho. While in Utah I went to Zion and Bryce canyon. Both of these parks had been on my want to visit list for years and they didn’t disappoint. The main thing I did in Zion was the Narrows. I had heard about this hike and seen many of my friend’s pictures from there. We went further than I expected and I didn’t get as many shoots as I wanted but it was a great experience and I am looking forward to doing it again in the future. We got to Bryce canyon just before sunset. This is a park I need to get back to and spend a couple of days at. The sunset was not great but the views at sunset point, and rainbow point were inspiring. Up in Idaho my dad and I spent a few days exploring areas we had hunted in years ago. The fall color was impressive. It is amazing how I noticed the scenery more when I wasn’t looking for deer. This shot was taking in Sheep Creek canyon the combination of the rocks, oaks, aspens, and the moon really caught my eye. The highlight of this trip was a spectacular sunrise at Oxbow bend in Grand Teton national park. Dad and I left Idaho Falls at 4:30 in the morning and got to Oxbow just in time to find a location down by the river as the sky started to lighten. Growing up in Idaho Falls the Tetons and Jackson is an area I visited a few times a year. However, I had never seen the sunrise at Oxbow and this one didn’t disappoint. There were actually three distinct “sunrises” the first was the cloud behind Mt Moran, the second is when the light moved down Mt. Moran, and finally when the light hit the aspens next to the river. Between the light show and the elk bugling all around it was a spectacular morning. My other favorite shots of the year a not from a specific photo trip but a mixture of odds and ends from other trips and experiments. The first is an abandoned bridge in Texas. It is possible to find the Milky Way near Fort Worth you just need to know when and where to go and this bridge over the Nolan is one of our favorites. This shot was for a closed subject competition for the camera club. The subject was curves and I found this shell at Hobby Lobby. The natural fractal curve pattern at the tip intrigued me. I built a small studio on my desk in my apartment. Consisting of some black scrapbooking paper a small flashlight and some DVD cases. I tried lighting the shell from different angles and then found that it was thin enough to really glow if the light was behind it. For this shot I actually built a platform and stuck the light up through a hole in the paper. I placed the shell directly on the lens of the flashlight. The blue on the side is the light leaking and reflecting off the black paper background. The final couple of shots are from the Old Rock church near Granfills Gap in Texas. It is an old Lutheran church which has great sight lines and a great tree to use as a foreground. We had a great sunset and then tried to some success getting the Milky Way in the gaps in the clouds. It was a great way to end a successful year of photography.